Address : KM13, Genting Highlands Resorts, 69000 Genting Highlands, Pahang Darul Makmur. I Love Genting Premium Outlet signage. Do take a memorable photo here with this signage. The Genting Premium Outlet and the Awana Sky Central as seen by the main road going up to Genting Resorts. Turn left to enter. The side view of the Genting Premium Outlet revealing its multilevel parking lots. Don’t be deceived by its huge mega mall architecture appearance as seen from the outside. From the inside is a non congested shopping environment. Majority of the floor space of the buildings are Multilevel parking lots. There is ample space for parking not only for shoppers, but also visitors who wish to have a convenient cable car ride to Genting Resort and theme parks above. Don’t forget that you can reach here by Bus express from Terminal KLIA, Pudu Sentral, KL Sentral, 1 Utama JB-Larkin, Jalan Pekeliling, Putra Gombak etc. The Awana Sky Central as part of the building complex (across the sky bridge from Genting Premium Outlet) is a Transportation hub by itself. The Genting Premium Outlet outdoors and plazas. Genting Premium Outlet can be very packed with shoppers during peak seasons. The sky garden and plants are part of the effort to bring healthy greens and sustainable environment into commercial areas. More plants at every floor. The concept of the mall is semi open architecture where all outlets is at a single to double level in three different elevation (High Street, Middle Street and Low Street). 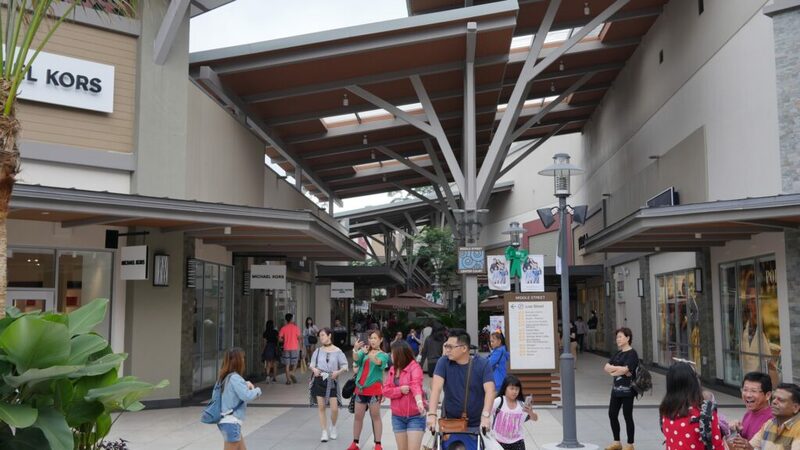 Shoppers can enjoy the cool highland breeze while outside of the outlets and have a breathtaking view of the highland’s mountain ridge. The breathtaking view of the mountains around the Genting Premium Outlet. There are many wide open areas for shoppers to walk around. High ceilings and green plants around the outlets provide shoppers good shade from the sun, while playgrounds and train rides allow kids to get entertained. Kids love to have a train ride around at the Genting Premium Outlet. You can redeem a free train ride with a Purchase of more than RM200 in a single receipt or you can pay for a ticket for RM10 per ride. The kids playground at Genting Premium Outlet. The Genting Premium Outlet Directory. Some of the premium outlets are listed below for your reference. The poster on some of the famous outlets at Genting Premium Outlet. If you feel that all these premium brands are not enough, don’t forget that the Sky Avenue is just a cable ride away via the Awana Skyway. You will find more outlets at Sky Avenue. Happy shopping for everyone! The Map of the Malaysian Food Street at Awana Sky Central. There is more food choices at the Awana Sky Central. Do visit their Malaysian Food Street at both Awana Sky Central and Sky Avenue. We do see many international visitors from Europe, America, Middle East, Africa and Australia. There are halal restaurants and surau available for muslim friends.